Two culinary pros served lunch to Burlington kids on Tuesday to highlight the important role school meals play in the community. 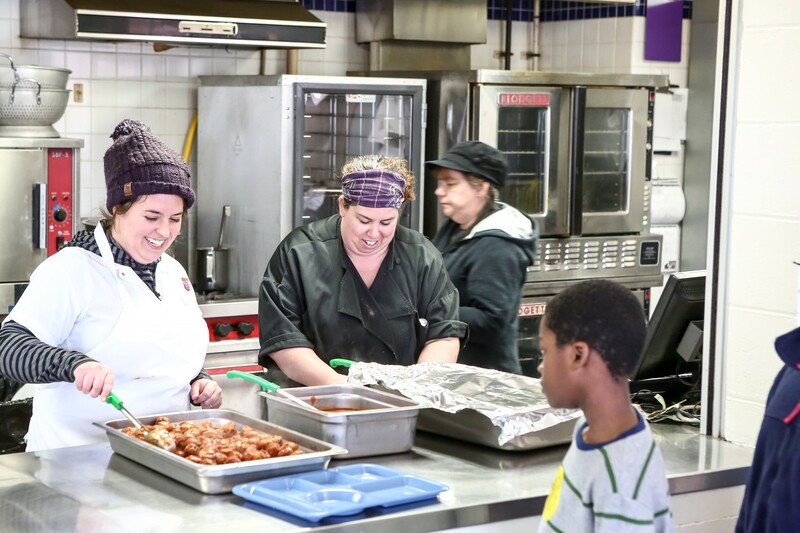 At Integrated Arts Academy in Burlington's Old North End, Butch + Babe's chef Jaclyn Major spooned turkey meatballs smothered in Bove's marinara sauce onto students' trays. 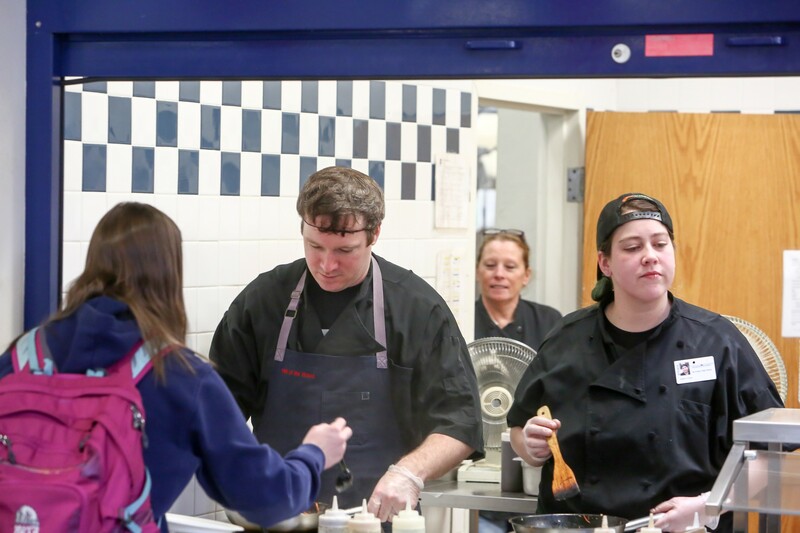 A few miles away, Jordan Ware, chef at Hen of the Wood and a 2017 James Beard Award semifinalist, stir-fried meat and veggies for teens at Burlington High School. Major and Ware didn't create the dishes they were serving. But they will do just that in a few weeks. On Wednesday, February 27, they'll team up in the Butch + Babe's kitchen to host Love School Lunch, a cafeteria-inspired meal for both kids and adults. Proceeds from the event will benefit the Burlington School Food Project, a farm-to-school program that provides breakfast, lunch and supper to students in the Burlington School District. 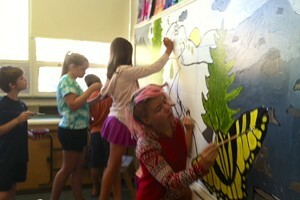 Both Butch + Babe's and Hen of the Wood have ties to the Burlington School Food Project. Kortnee Bush, owner of Butch + Babe's, worked in the cafeteria at Burlington's Hunt Middle School before opening her restaurant. And Ware's sister works in food service at Burlington High School. Burlington School Food Project food education and youth outreach manager Sarah Heusner said the Butch + Babe's event is designed to highlight her organization's role as a major provider of food to the Burlington community. The Food Project provides 4,100 meals to Burlington kids every school day. In 2013, it launched the Fork in the Road food truck, a culinary job training program for high school students in the summer months. And this year, Heusner said, the Food Project has been providing take-home food bags to more than 60 food-insecure families before snow days and school holidays to ensure they're fed even when kids aren't in school. Major said she's still mulling over the menu for the end-of-the-month fundraiser. She initially thought she'd prepare meatloaf but after seeing kids' enthusiasm for the cafeteria fare at IAA, she's thinking of doing her own take on meatballs. She's also entertaining the concept of a dessert table like the one she remembers from her Catholic school days in Baltimore — with little cups of Jell-O and pudding, and slices of cake. As the mom of a soon-to-be kindergartener, Major said she's used to sneaking extra vegetables into dishes, so the food will be nutritious. A vegan option will also be available. Diners can expect a line for food, communal seating and menu items served on plastic trays borrowed from the schools. The goal, Major said, is to transform the restaurant "into a cafeteria for the night." Find more about the Love School Lunch fundraiser on Wednesday, February 27 here. Cost is $10 for kids 12 and under, $16 for adults and $12 for Burlington School District employees.